The Ellipse Aura combines Fishman's most sophisticated soundhole-mounted preamp design with the power of Aura Acoustic Imaging Technology for exceptional accuracy and true to life sound. Up to four images can be downloaded from the Aura Image Gallery software (included) through an onboard mini-USB port to match the instrument's natural tonal characteristics. 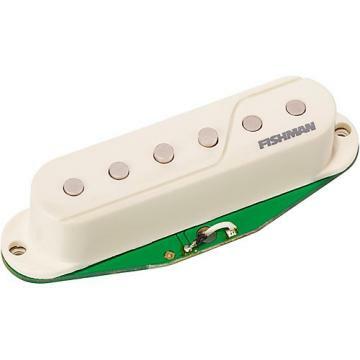 The Fishman Ellipse Aura features pickup/image blend, volume, and switchable Natural I and Natural II low-frequency tone shaping. A phase switch and automatic anti-feedback device control feedback. The guitar pickup's ergonomic soundhole-mounted design puts slider controls at the player's fingertips to maintain a natural playing position. A patented neodymium magnetic mounting system enables easy, solder-free installation on your acoustic guitar with a variety of size formats that accommodate most round soundholes from 3-7/8" to 4-1/8" in diameter. Equipped with a low battery indicator, the Ellipse Aura pickup includes a no-hassle, solder-free Acoustic Matrix undersaddle pickup in a narrow or wide format option. The Fishman aura elipse is the best sounding pickup system I have ever used and I have used several others. There are many good pickup systems out there and there are a few that still sound like they are from the 80's. I tried the systems with the micraphone but had lots of trouble with feedback, no good. I tried the soundhole mounted pickup but it was very dificult to get a good string balance and the eq range didn't go above about 14000 hertz, no good. I tried the system with sensors built into the wood but every guitar built by that manufacturer sounded the same and could only get that pickup on that manufacturers guitars. I could go on and on. I just thought it was strange there was no feedback for this item, and there should be. .I had tried several solutions to try and get a simple yet accurate sound quality when playing in concerts and at gigs for my Collings and Martin guitars. K&K, LR Baggs anthem, LR Baggs blended, stage microphones, and most recently, the M80 sound hole pickup. They all worked, but none made the guitar sound like it truly was supposed to sound. Finally, I installed this Aura Ellipse in my Martin OM28 Marquis. First strum with the correct image and I knew it was everything I was looking for. Finally, my guitars sound like the expensive instruments that they are. And no messing with anything at the gig site. Just plug in and GO! No feedback, no EQ challenges, just play. The system disappears in the sound hole so the look of the guitar is not harmed in any way. Now I understand why professionals are using this system so often. It is simply the most practical, accurate, best sounding way to amplify a nice acoustic guitar that there is. .I have the eclipse aura in my Baden guitar. it quit working but I'm going to get another one because it sounds so good!